In ordinary times, a special election for an assembly seat in Lodi, and another for a senate seat in Green Bay would attract little attention beyond the district borders, if that. But there have been no ordinary times in Wisconsin politics since 2010, and the results of two upcoming special elections are poised to take on national significance. They come on the heels of two elections that received national attention: new Democratic state Sen. Patty Schachtner won a special election in January in a heavily Republican district and Rebecca Dallet won a seat on the non-partisan Supreme Court in April. Both races received national coverage. Gov. Scott Walker did himself no favors in refusing to call special elections in the two districts, leaving tens of thousands without representation in the legislature. The general consensus was that he did so since the Republicans would be likely to lose. Better to wait until the fall elections when dark money would be more freely flowing. Walker said he did it to save money on the cost of a special election, but both elections could have been called for the normal February primary and April general election, as Urban Milwaukee has reported. Instead of being granted his dream, Walker was forced into court by former U.S. Attorney General Eric Holder, who prevailed. This, too raised the national profile of what should have been sleepy little races. “The Eyes of the Nation will be on Wisconsin this June 12 for the Special Elections that Eric Holder forced Walker to call.” — Even the the lead sentence in an invitation to a Milwaukee fundraising event for the candidates stresses the national significance that the Democrats attach to the race. Perception, momentum and turnout on election day are powerful forces, as are the activities of the candidates in the field. But, unlike in ordinary times, the candidates must range far from their home districts to raise funds for their campaigns. Ann Groves Lloyd, who hopes to represent the 42nd Assembly District (in Columbia County, just north of Dane County) and Caleb Frostman, who seeks the 1st Senate District seat (including Door and Kewaunee counties), will be joined by state Democratic party chair Martha Laning in Milwaukee on Monday, May 14th from 5:30 p.m. to 7:30 p.m. at Kane Commons. The event takes on the flavor of a Progressive Dinner Party since it will be held at three neighboring homes. “Progressive” would also be applied to the political flavor of the evening. Frostman will be at the home of Brett Timmerman and Patrick Mutsune. The couple have hosted political events in the past, including multiple fundraisers for Sen. Tammy Baldwin. This Saturday they are also hosting a fundraiser for Mahlon Mitchell and his campaign to become governor. Party chair Laning will be just upstream at the home of Drs. Beth Gore and Stu Wong. Lloyd will be right next door at the home of Julilly Kohler, who has hosted dozens of such events, and who also was the developer of the eco-friendly riverfront subdivision that includes green roofs and geothermal wells. A win in either of the districts would help the party build momentum for the midterm races, which are believed to favor Democrats. Decisive victories could also raise the profile of other obscure Wisconsin races to national stature. There will be no primary election for the Democrats, who are running unopposed. Caleb Frostman resigned from his position as the executive director of the Door County Economic Development Corporation in April to run for the 1st Senate District seat held by Republican Frank Lasee, who resigned at the end of December 2017 to take a job in the Walker administration. This is considered a “pivot” district. It voted for Obama in 2008 and 2012, but for Trump by a huge margin in 2016, with Hillary Clinton getting just 38.5 percent of the vote. 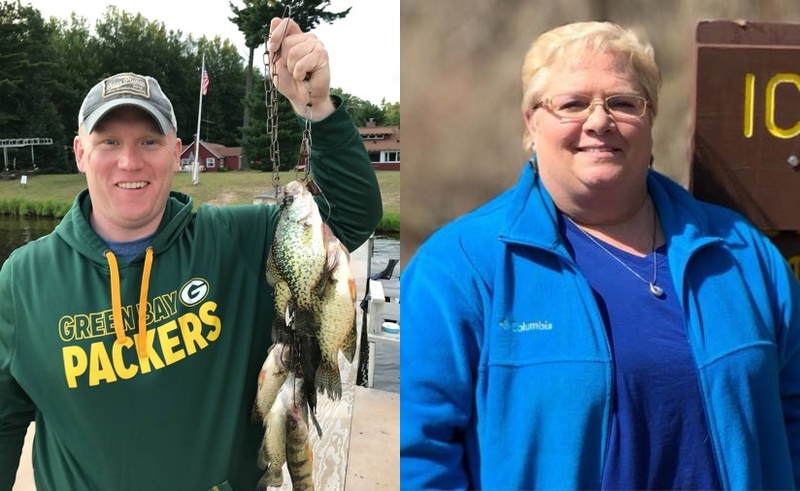 Frostman’s campaign portrait shows him wearing a Green Bay Packers shirt while holding a string of freshly caught panfish. Frostman poured concrete for his family’s company while working his way through public schools, and also worked in real estate financing for a decade prior to his economic development work.”He fondly refers to hunting as ‘the most significant piece of my identity, just ahead of being a Green Bay Packers fan,’” according to his website. Ann Groves Lloyd was born on the family farm in Lodi, and lives in the community today. She hopes to replace Keith Ripp, who resigned from the Assembly on the same day as Lasee, also to take a job with the Walker administration. The district north of Madison is also considered to be a “pivot” district by the Democrats. William P. Groves served in the assembly in 1935; Harold Groves served in the assembly from 1930-32 and in the senate from 1932-36, during the great era of Progressive Party dominance of Wisconsin, then known for its clean government.